Besides the launch, one of my favorite and most memorable experiences of my trip to Kennedy Space Center (KSC) was the late afternoon tour I got to take of the center. And as luck would have it I got to have some personal alone time with a real spaceship on a Friday afternoon out at a gantry near the launch pad. Here are some of the pictures I took on that late afternoon tour. The VAB is where all manned spaceflight rockets are assembled before launch. 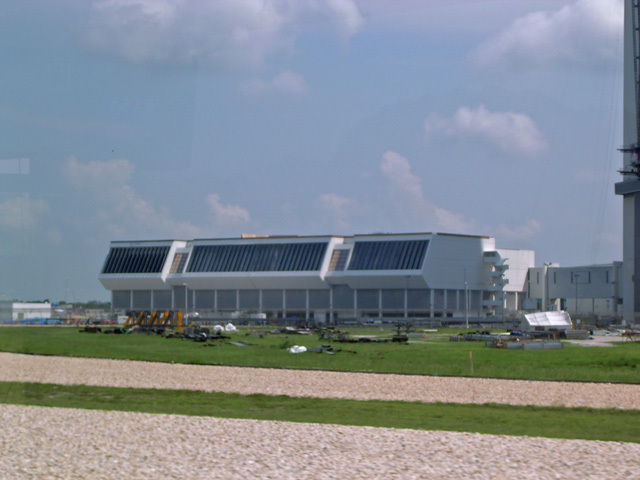 Originally it was built to assemble the huge 36-story high Apollo Saturn 5 rockets to go to the moon. 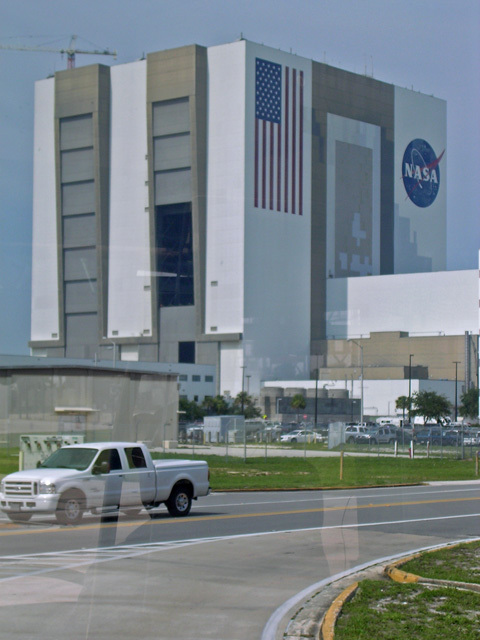 It dominates the entire Kennedy Space Center. When built, it was the largest building by volume in the world (it's now 3rd). It's 52 stories tall, covers 8 acres of ground and contains 129,428,000 cubic feet of space. 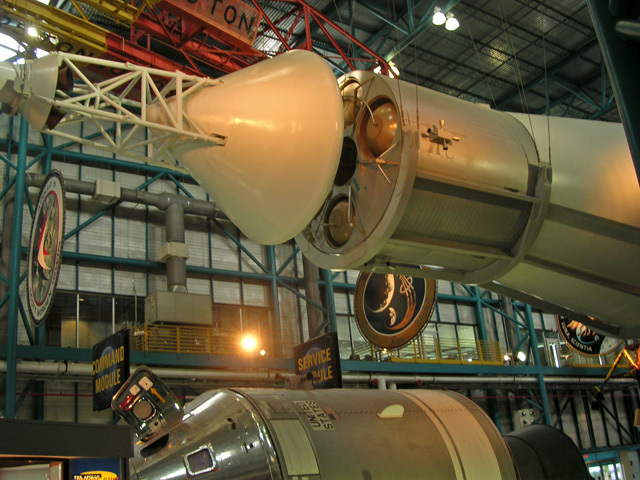 It has four bays and was designed to be able to assemble four Saturn 5 rockets at once. As tall as the building is, the lighting rod at the top of the Saturn 5 had to be removed to get it out of the building. It's size is deceptive, it doesn't look as big as it is. That's partly because of it's width, which makes the building look shorter and smaller. In reality, it's like four 52-story skyscrapers stuck together. One of the stripes of the flag is wide enough for a full size tour bus to drive on. Follow these links to two design pictures, here and here. You can get the feel that this was really futuristic stuff back in the early '60's when they were designing it. You can read more about the VAB here. 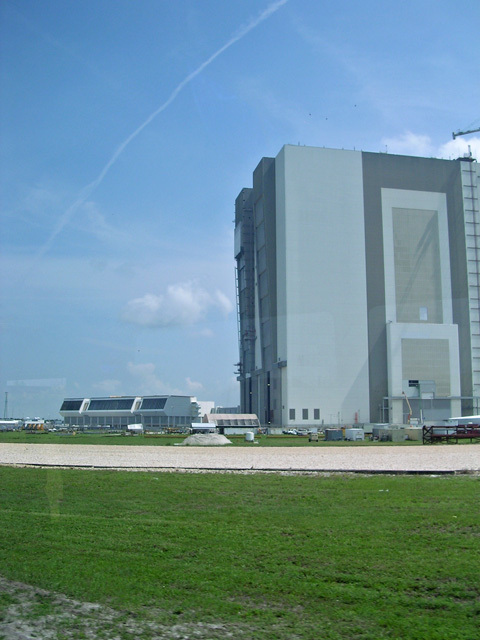 This link has a few pictures of the VAB under construction. Over 40 years, the black painted trim of the gigantic building has been faded to a light gray by the searing Florida sun. The crane is to help with repairs and modifications that are still on going from damage caused by Hurricanes Charley and Frances. 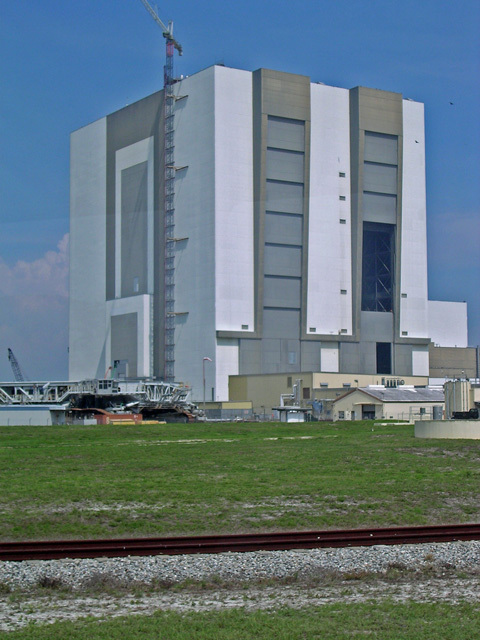 An upper corner of the VAB now serves as the resting place of the crated remains of the Space Shuttle Columbia. As the tour diver said with an emotional voice, "Columbia finally retuned, and is now tucked away in the safety of the Vehicle Assembly Building for all time". You could hear the pain of the accident in his voice. It brought the reality of the tragedy a little more home to me. 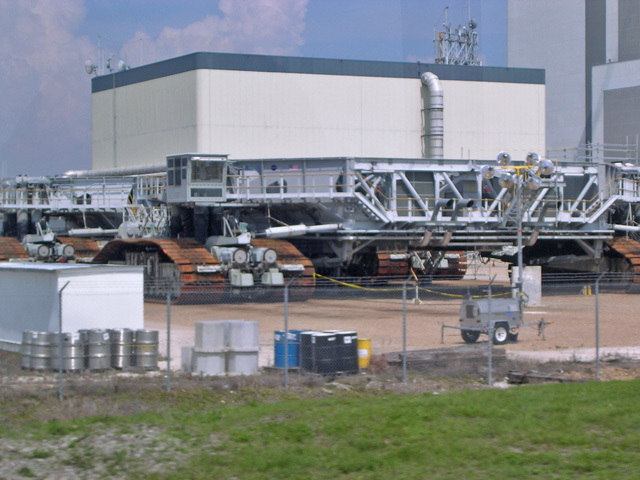 This is one of the crawlers that move the launch platform and spaceship (first the Saturn 5 moon rocket and now the Space Shuttles) out to the launch pad. There are two crawlers, one named Hans, the other named Franz. These machines were once the largest tracked vehicles in the world (now surpassed by a giant German excavator). Each one of the shoes that make one of the tracks weighs 1 ton. The crawler by itself weighs 6 million lbs. The crawler drives under a launch platform and lifts it onto it's back. The Shuttle, External Tank, and Solid Rocket Boosters (SRBs) are then all stacked (assembled) on top of the launch platform. The crawler-transporter then balances the whole 11 million pound platform and Shuttle assembly on it's head and drives out to the launch pad. The whole thing weighs 17 million pounds as it drives out to the pad. In the Apollo days, it had to balance a 36-story Rocket and Launch Tower as it moved down the crawler-way to the launch pad! The crawler is powered by two 2,750-hourspower diesel engines that power four 1000kW generators that then power the 16 electric traction motors. Two 1,065-horsepower engines power the hydraulics for leveling and steering, as well as the lighting, and ventilating. Here can read more and see more pictures of the crawlers here, here, and here. 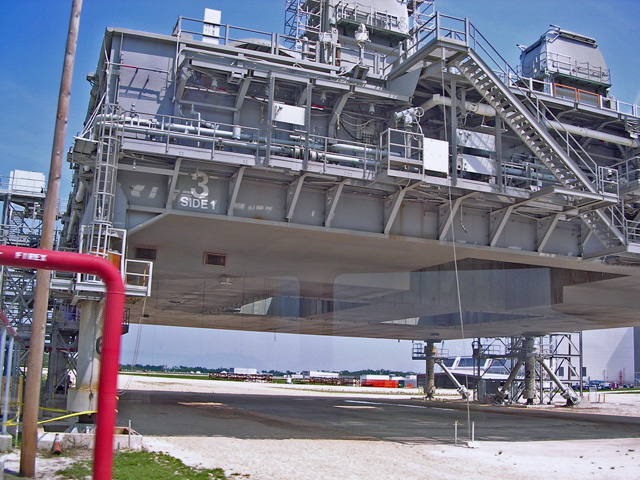 Here's a mobile launch platform. 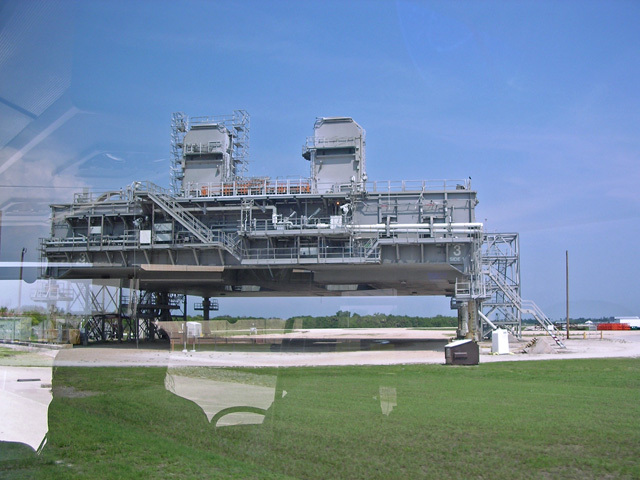 The platforms originally had a 380 foot tower structure on them to support the Saturn 5 moon rocket. The tower was removed and these wing supports added to convert the platform for use by the Shuttle. If you look in the middle of the underside of the platform, you can see the openings where the blast jets from the Shuttle's three main engines and the Sold Rocket Boosters comes through the platform. Like everything else here this is much larger than it looks. The Crawler just drives in under the platform and lifts it up and onto its back and takes it and whatever is on it where it needs to go. Beside and below the VAB is Launch Control. As you might guess, this is where the control room for launch is located. The Shuttle launches are all controlled from Firing Room 4. Tomorrow, 300 NASA and contractor personnel will be in the Firing Room. This is where all the checks and monitoring of the Shuttle happens. The launch director and engineers are already there checking on all the components of the Shuttle as it gets ready to launch tomorrow. You've probably heard the launch director on TV or in movies like Apollo 13 as he goes down the list and polls the status of each section. 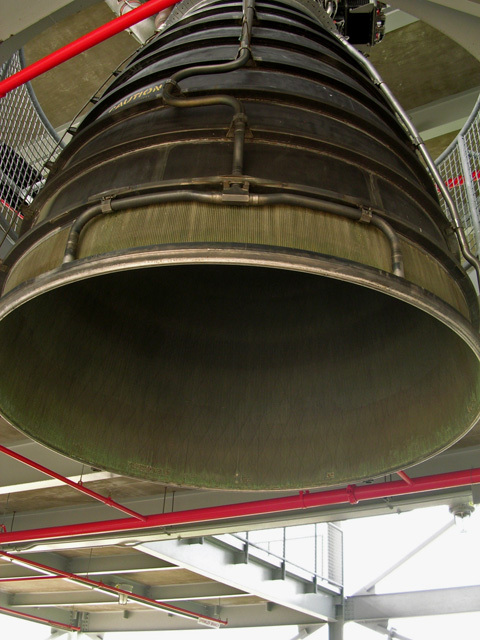 This is the business end of a Saturn 5 moon rocket. 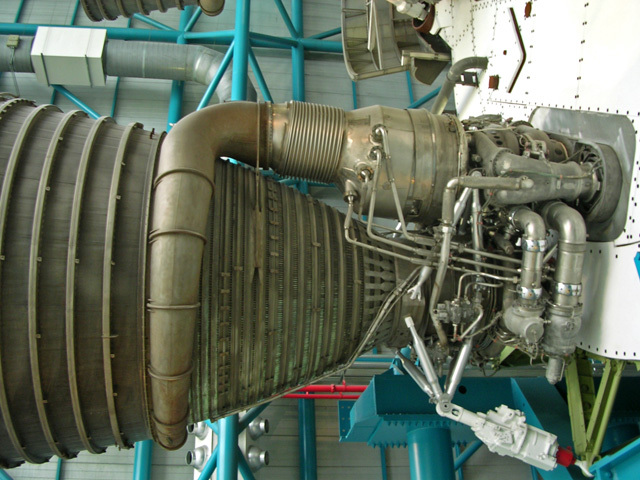 The Saturn 5 was the most powerful machine ever built by man. 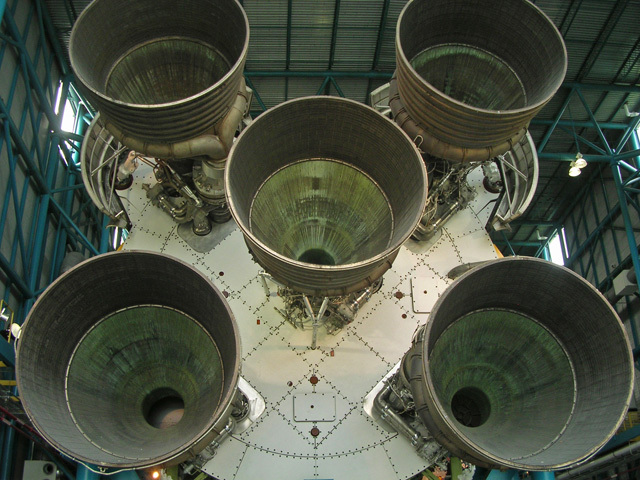 These five F1 engines on the first stage generated 7.5 million pounds of thrust. Easily enough power to lift the entire 36 story, 6.1 million pound rocket, from 0 to 6000 miles per hour in 2 1/2 minutes. The "top" of the Saturn 5 at the other end of the building. Here you can see the Service Module and Command Module both attached to the Saturn 5 and separate as they were on their way to the moon. The silver part is the Command Module. 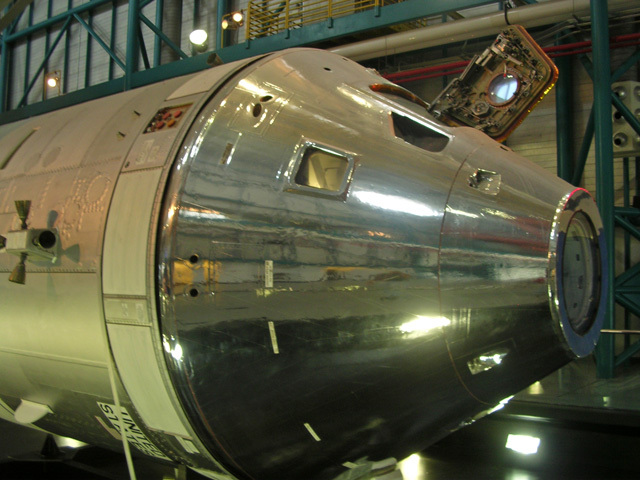 The astronauts rode in this capsule up into space and returned to earth in it. 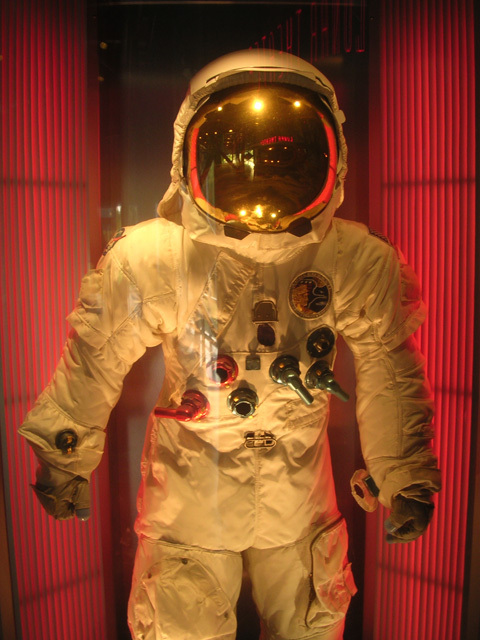 A real Apollo space suit. There was also a real moon rock inside a sophisticated display case that you could reach into and touch. So I did get to touch a piece of the moon. As with a lot of the experiences on the tour, I was so excited and overwhelmed that I didn't think to take a picture. I was too busy taking it all in. From the Apollo/Saturn 5 Center, the tour bus takes us on out to the LC39 Observation Gantry. From there you can get a 360 degree view of the entire complex from it's open forth floor. Sorry, but once again I didn't think to take a picture of the whole gantry. Hanging between floors in the gantry was a Space Shuttle Main Engine (SSME) that actually helped push a Shuttle into orbit. This is a lot bigger than it looks. When the hydrogen is burned with liquid oxygen in the combustion chamber, it reaches temperatures greater than 6000 degrees Fahrenheit. The pumps and valves where EXTREMELY complicated. 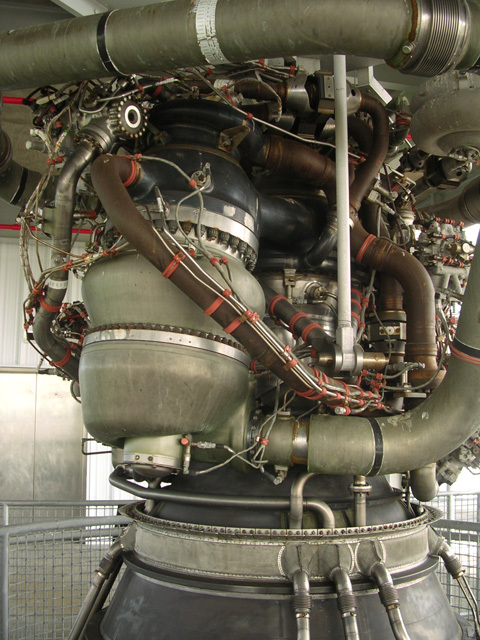 This was some of the most complicated and sophisticated machinery possible in the 1970's and is still the most advanced liquid-fuel rocket engine ever built. It has the highest thrust to weight ratio of any rocket ever built and is the most efficient at 99%. 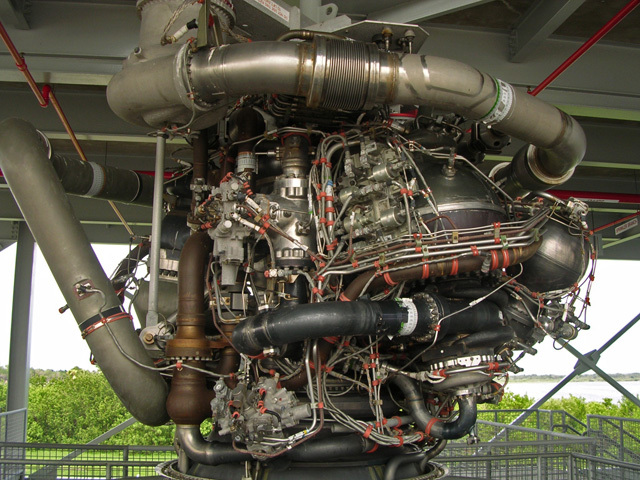 It weighs right at 7000 lbs and at sea level, at max thrust, generates 488,000 lbs of thrust. That's about 12,000,000 horsepower! The protective Rotating Service Structure (RSS) is still around Discovery as they perform last minute inspections. You can see the top of the external tank sticking out. 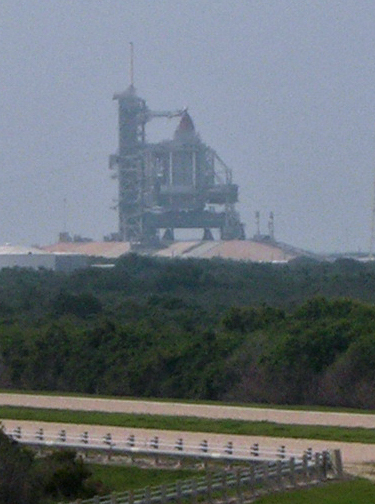 The RSS will pivoted out of the way in just a little while, leaving Discovery exposed on the pad. Since we were the last at the gantry, Kenny and I had the whole place to ourselves. Not a sole was there except the bus driver in the bus. We were going to be last "civilians" to be this close. The sun is setting and a warm moist breeze is blowing in off the shore. It was quiet, not a sound except the call of the gulls overhead. I almost thought I could hear the sounds of the surf on the beach. As we stand there looking out at the ship, I get a real sense of her. ... a real spaceship right in front of me.